"Great for personalizing jewelry & craft components! • Punches create 1.5mm (1/16 inch) tall stamped impressions • Includes 9 number punches: 0, 1, 2, 3, 4, 5, 6/9*, 7, 8 (*To stamp a 9, hold 6 punch with marked side under forefinger) • Use to stamp metal (copper, silver, brass, clay, wood, plastic, & leather). 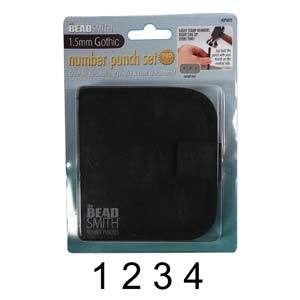 • Durable construction • Punches are marked for easy letter orientation: Simply place a thumb on the side marked BEADSMITH to ensure the stamped letter faces the correct way. • Compact deluxe canvas storage pouch • Individually labeled slots keep punches organized."